Before starting my talk on actual Tax Planning let me share one small incident happen with our one client, one of our client has made lump sum investment in ELSS for tax saving purpose on advice of his friend. This investment was made in Jan, 2008 (30000 Rs/-). At that moment Sensex was at 20000 levels almost in Bull Run. This lump sum investment done in hurry at the end of year still could not give him good return. This could happen with you also. Your lump sum or one time investment may not give you good return if it is made randomly during year end without any planning. (1) ELSS investment for Tax saving is advisable only through systematic investment. (2) Don’t do any investment in hurry, always plan. (3) Investment done without planning and knowledge can turn in to disaster. (4) Carry out independent analysis before making any investment. Financial Year is about to end if you have yet not planned for saving Income tax than you don’t have much time now for tax planning. You must do your tax planning as early as possible so that you can make investment before 31st March, 2012. Section 80C of the Income Tax Act allows certain investments and expenditure to be deducted from total income up to the maximum of 1 lac. Apart from that additional amount of 20,000 Rs/- dedication is allowed by doing investment in Infrastructure Bond under section 80CCF. Apart from that you can claim additional deduction by paying premium on medical insurance & on housing loan interest. 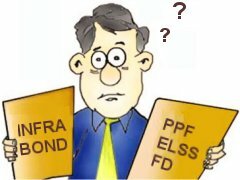 PPF refers to Public Provident Fund it is Long Term Debt Scheme of the Govt. of India on which regular interest is paid. Any Individual can invest in this scheme and can earn a good tax-free return. The Public Provident Fund is the most favorite tax saving option. 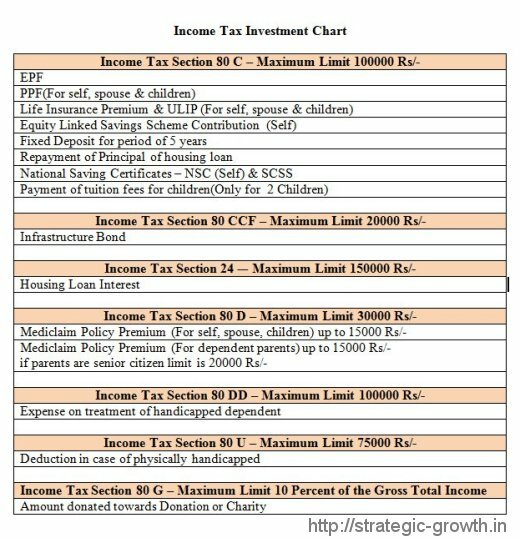 One can get deduction on income for the investment done in this scheme. As this scheme is launched and governed by government of India it is totally safe investment. PPF scheme is for a period of 15 years. The minimum investment required in a PPF account is Rs 500 per year and the maximum investment amount is Rs 100000 per year. You can open PPF account in bank and deposit up to 1 lac in year to avail tax benefit. Apart from tax benefit you will also paid with 8.6% interest compounded annually. For Salaried people EPF is deducted compulsorily from the monthly salary. Contribution made by employees is eligible for tax deduction under Section 80C. Payment made in lieu of insurance policy is eligible candidate for tax deduction under 80C. Life insurance is way to provide protection to family against any undesirable event. Life Insurance provides the dual benefits of savings and security. Insurance policy available in market are many, selection has to be done by you considering your requirement. If you have yet not taken any life insurance it is advisable to go for “Term plan” which will provide you good risk cover at low premium. Most suitable tax saving option for everyone is ELSS (Equity link saving scheme). Investment made in this scheme for the long term can provide best returns. ELSS has lock in period of 3 years meaning one cannot withdraw money before 3 years. Remember to invest in ELSS always via SIP route don’t make one time lump sum investment. As investment made in ELSS is exposed to equity & risk is involved in doing so. Investment made in Fix deposit for 5 years and above in scheduled bank can be claimed for tax deduction under 80C. Interest rates offer by most of the bank now a day is around 9 %, which makes this option good for investment but remember that return on this FD is taxable meaning on maturity one has to pay tax, which cause return less than 9%. If you have yet not purchased any house for living and you are planning to purchase please do that and while purchasing please take Home loan. This will not only reduce your initial investment burden also provide you advantage in saving tax. If investment made in section 80C are not sufficient for you can get more tax benefit by Investing in Infrastructure bonds under 80CCF. Maximum limit of investment in Infrastructure bond is Rs. 20,000. This bond provides you fix return currently 8.7%. One of the oldest option for tax saving is NSC. Now a days as lot of other option are available this option is less popular. National saving certificate investment will provide you return of 8.4 %. Investment time period is reduced from 6 year to 5 year recently. Not only principle you can claim tax also as reinvestment under 80C for NSC. Senior Citizen Savings Scheme is only for individual with age greater than 60 years. This scheme provides 9 % returns. Maximum Investment of 15 lakh can be made under this scheme this scheme has lock-in period of 5 years. Medical expense now a days are skyrocketing, if you want to make yourself secure from undesirable medical expense you can purchase mediclaim policy and claim Mediclaim Policy Premium (For self, spouse, children & dependent parents) for tax deduction under 80D. Maximum limit of this deduction is 15000 Rs/- for self, spouse and children. Additional 15000 Rs/- can be claimed for dependent parents. Payments made towards tuition fees for children to any school or college or university or similar institution can be claimed for deduction under 80 C. (Only for 2 children). This also includes payment made towards coaching fee of various competitive exams. If you are incurring expenditure for the treatment of your handicapped dependent, you could claim a deduction under section 80DD. This deduction is allowed for dependent parents, spouse, children and siblings. Dependents must not have claimed any deduction for their disability. Maximum limit is Rs 50000, for severe handicap conditions Rs. 1,00,000 is the deduction limit. Under 80U individual with disability can claim deduction this deduction is allowed only if you furnish copy of certificate issued by medical authority. Maximum limit in this section is Rs 50000 and if person is with severe disability deduction of Rs 75000 is permissible. If you are seeking additional benefit of tax saving than you can make donation/charity to any register trust and claim it for tax benefit under 80G. This options of tax saving should be used depending upon how much you want to save and what is your expectation of return from it. Proper tax planning should be done in alignment with your financial planning before making investment. To make your life more comfortable everything is summarized in following chart. Hi there, I discovered your website by way of Google whilst searching for a comparable topic, your web site got here up, it looks good. I have added to my favourites|added to my bookmarks. very good article. contribution under new pension scheme comes under which section of tax rebate. Section 80CCD of Income tax includes both the employee’s as well the employer’s contribution to the NPS. As per current provision aggregate deduction under sections 80C, 80CCC and 80CCD is limited to 1 lakh rupees. Sweet internet site , super pattern , real clean and utilise genial . You may deduct quiaeflid medical expenses you pay for yourself, your spouse, and your dependents, including a person you claim as a dependent under a Multiple Support Agreement. You can also deduct medical expenses you paid for someone who would have quiaeflid as your dependent for the purpose of taking personal exemptions except that the person did not meet the gross income or joint return test. You deduct medical expenses on Form 1040, Schedule A (PDF), Itemized Deductions. The total of all allowable medical expenses must be reduced by 7.5% of your Adjusted Gross Income. For more information, refer to Publication 502, Medical and Dental Expenses. Its a very good sharing blog regarding saving additional tax . Most of the queries are clear regarding tax saving from this blog.